Updated October 18, 2018- Great News! I now have a residence inside Playacar where I keep bikes so it’s possible to deliver to smaller groups without 24 hour notice and on weekends. 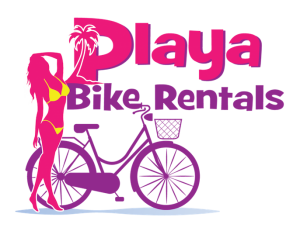 24 Hours Notice Required by Playacar Administration to obtain a FOLIO (Permission Password) to enter Playacar with Rental Bikes. We are happy to meet you at any gate entrance if you want bikes after the allowed delivery times. We have been providing Playacar Bike rentals in Fase 1 and Fase 2 Playacar since the beginning in 2012. When we started we did not even have a truck and used to ride the bikes in, ponying two bikes and running back to get more. Since I’m a personal trainer I didn’t mind and actually used to joke that it was probably faster than using a truck with the traffic and overdone speed bumps in Fase 2 Playacar. The funny thing is it could not have turned out to be more true. The truth is, nowadays, in many parts of Playa you will arrive much faster on a bike than by car, especially when you consider parking and current traffic conditions in 2018. When we later starting delivering bikes with a truck we right away had difficulties with the security guards at the entrance of Fase 2 Playacar. Fase 1 playacar is no problem, they know us and apparently are able to use common sense and allow us to provide our service to their owners and guests without the complications we’ve experienced trying to enter and leave Playacar 2 with bikes in a truck. The administration and security gates for fase 2 are well known for going overboard on the security at times an not allowing people to enter who are living or vacationing inside the giant gated community. It turns out that delivering rental bikes in Playacar makes us what the administration calls a “Provedor” which I have figured out is not a good thing. The rules for entering Playacar as a Provedor (someone with bikes in the back of their truck) are quite complicated and restricted, Senor Frederico, the big boss in the administration office, explained to me that this is for “Security”. Photos, IDs and Documents with lots of stamps on them from all my relatives and known associates….. OK,OK Just kidding on this last one. This all seems kind of silly to me since they all know me now and I have been delivering bikes inside Playacar Fase 2 for 5 years. Meanwhile, sketchy looking people are walking and riding bikes in and out all day with backpacks without showing an ID or being questioned in any way and Pizza Deliveries are allowed without a Folio at any time. So, the saga continues as I continue to plead with the Playacar administration to allow more hours to make deliveries and perhaps lifting the silly 24 hour rule which applies to bike deliveries but not Pizza thank God. Like so many things here, because it’s Mexico it will probably take some time to resolve, or may not get resolved. So for now in 2018, if you are staying in Playacar 2 and would like to have bikes delivered please keep in mind the delivery restrictions or we can meet you outside the gate entrance on 10th Ave. at the administration office and say “Hello” to the friendly staff and thank them for keeping things secure in Playacar Fase 2.